Wreaths were once the domain of the Christmas holidays but that's not the case anymore. Today people use wreaths to decorate their front doors and other areas of their home with every holiday and season that passes. Spring wreaths are especially popular because of their bright colors, floral inspiration, birds and butterflies. Get your hooks out and get ready to crochet your own wreath for springtime using these 15 fabulous patterns. Nothing says springtime more than birds peeking out of their nests and flowers popping their heads out of the grass. This crochet wreath absolutely embodies the best of spring crochet patterns. This wreath is called the Butterfly Wreath because the free crochet pattern includes the suggestion to hang crochet butterflies from the design for a true springtime look. But even without the butterflies, this pastel crochet wreath sings of spring! This striped crochet wreath has bold flowers that transcend the seasons. Work them in white, pink or yellow for a spring design. 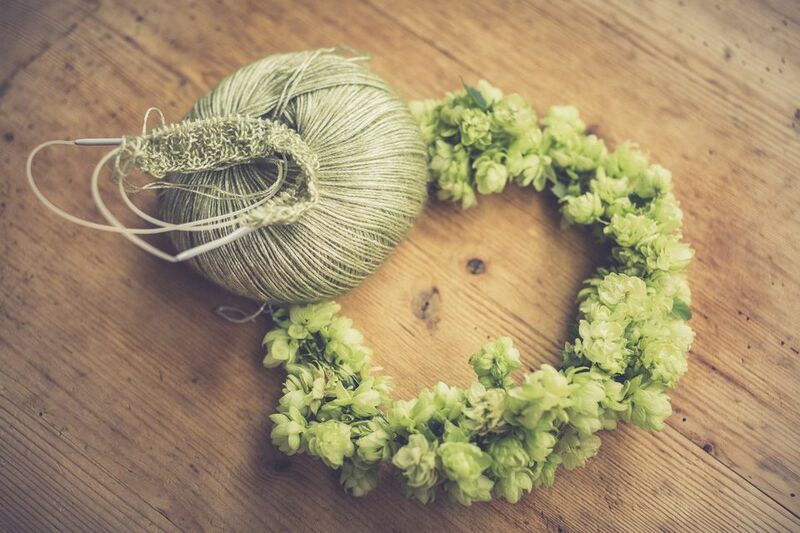 Bring nature into your home this spring with a DIY wreath made from mulberry branches (or other similar wood). This tutorial shows you how to make the wreath and add crochet flowers in a soft palette for a beautiful springtime design. This is a simple green crochet wreath that has been adorned with a garden of button crochet flowers and a smiling little bee. The first big holiday of spring is Easter so you might want to crochet a wreath to celebrate. This one includes the saying "Hoppy Easter" and a big crochet bunny. Designer Lucy of Attic 24 has created a number of beautiful, brightly colored crochet wreaths including one called the Springtime Wreath but one of the best showcases crochet roses against a striped background. This is another take on the crochet roses wreath. This one shows you how to turn flowers into crochet granny squares and use those squares to create your wreath. There are so many different types of flowers to crochet, each one more unique than the last. Here we have several different ones put together in one spring wreath. With two types of crochet flowers accented by a third lace flower, this DIY wreath built on a basic pre-made frame is easy and perfect. Done in the right colors, it would be a great wreath for decorating a springtime wedding. Spring is the season for falling in love. The two owls here are in love under the pretty flowering tree and the smiling sun. You will fall in love with this crochet pattern! This spring wreath stands out against the crowd even before you add the felt buttoned flowers to the design. That's because of the unique crochet ruffle that makes it a soft, lovely wreath in any color. This pattern teaches you how to wrap a wreath farm with yarn for the foundation of your spring wreath. Then you can add whatever embellishments you like; in this case, flowers that are strategically laid out in two spots like they've just sprung from the garden. This is the easiest crochet wreath that you will ever make since it just requires you to crochet a long chain and loop it a few times. This is a small ornament sized wreath. Make a bunch of them for a bright springtime wall display. This is a classy crochet wreath to use in your home all year long. It also makes a great housewarming gift for others. Choose colors that say "spring" to you!